Installing a pre-release version of your web browser promises at least two distinct thrills. The first one: You get to test new features sometimes months before mainstream users see them. How cool is that? But let’s assume you’re up for the challenge and eager to see what’s next for your browser. Here’s what you need to know about pre-release versions of Chrome, Safari Technical Preview, Firefox and Edge. Google maintains three release channels for Chrome builds — Canary, Dev and Beta — in addition to Chrome Stable, the final release channel. Canary, as in “canary in a coal mine,” is the experimental version of Chrome, in which Google throws new features at the wall, spaghetti-style, to see what sticks. It’s updated daily. From Canary, features migrate (or not) to Chrome Dev. Dev is, in essence, alpha software. It’s updated once or twice weekly. Chrome Beta, updated about every week, is the most reliable version of Chrome aside from Stable. 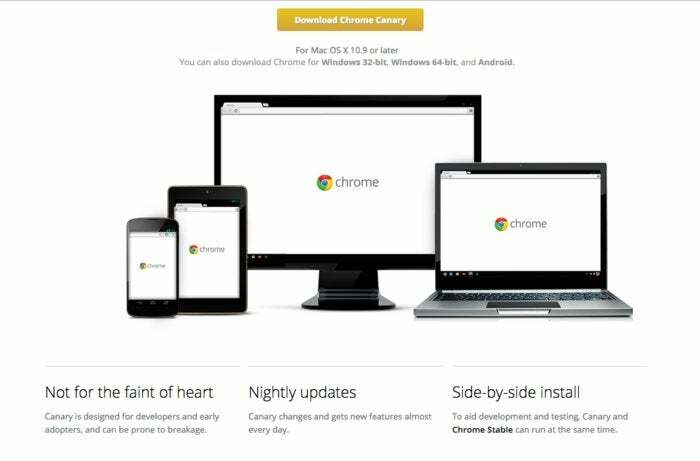 You can download Canary, Dev, Beta and Stable on The Chromium Projects’ download page. All four are available for Windows 64-bit and 32-bit PCs, Macs and Android devices. For iOS, only Beta and Stable are available. For Linux, Dev, Beta and Stable, but not Canary, are available. Now, some good news. You can run Chrome Stable on the same machine as Canary, side by side, so you don’t have to dedicate a machine to Canary. In August, Google announced that you could also run Dev and Beta builds on the same machine as Chrome Stable. Anyone can download these builds. Among the most anticipated features likely to appear in Chrome Stable is Chrome’s built-in ad blocker, which will block pop-up and some other ads, including those that automatically start playing video and audio, on desktop and mobile devices. (Of course, there are already plenty of ad-blocking Chrome extensions, such as Adguard AdBlocker.) You can learn more about Chrome channel updates on the Chrome Releases blog. 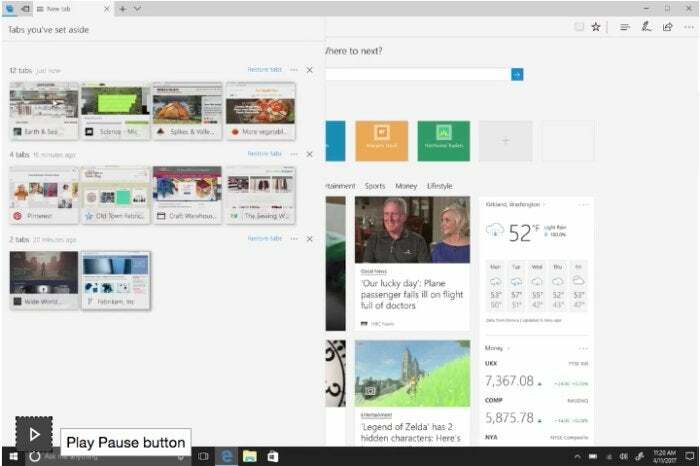 Microsoft Edge is the default browser for Windows 10 desktops and mobile devices. For a sneak peek at upcoming Edge features, start by joining the Windows Insider Program, which gives you access to upcoming Windows 10 features before general release. From there, you can install Windows 10 Insider Preview, which includes Edge, on a Windows 10 machine. There are three Insider Preview “rings,” or categories, defined by the frequency of Preview builds: Fast Ring (for eager beavers wanting new features ASAP), Slow Ring (where builds are more stable), and Release Preview Ring (in essence, beta). Give the program overview a read first, so you’ll have a better sense of what you’re getting into. Don’t like the idea of giving over your Windows machine to a still-in-development version of Windows 10? One alternative is to download a Microsoft-provided virtual machine and run an Edge preview version on it. You can test Edge on a Mac using a Microsoft virtual machine and selecting VMware or Parallels software, which run Windows on a Mac OS computer, as your virtual machine’s platform. Your virtual machine will expire after 90 days, however. With the Windows Insider Program, you can get a jump on the next release of Windows 10, the Windows 10 Fall Creators Update, due in September. Among its features are Timeline, which sounds like Apple’s Time Machine rollback feature; new Movie Maker features that include 3D effects; and support for Microsoft’s Windows Mixed Reality headsets and controllers. The most bleeding-edge option on the open-source Firefox development train is Nightly, which, as the name implies, is updated, if not nightly, then close to it. It’s the least stable pre-release Firefox browser. But it’s also where you’ll get access to features months before they reach the final Release channel. Nightly has its own blog, with notes about updates, patches and new features, and a Mozilla Wiki page, too. Developer Edition is, as the name suggests, specifically for website developers who want to “create and debug web experiences with powerful, open source tools.” Developer Edition isn’t its own channel. Rather, it’s a version of Firefox that provides tools specifically for developers and is based on the Beta build. Mozilla eliminated a separate developer channel called Aurora earlier this year, to shorten the time required to get from Nightly to the final release version. 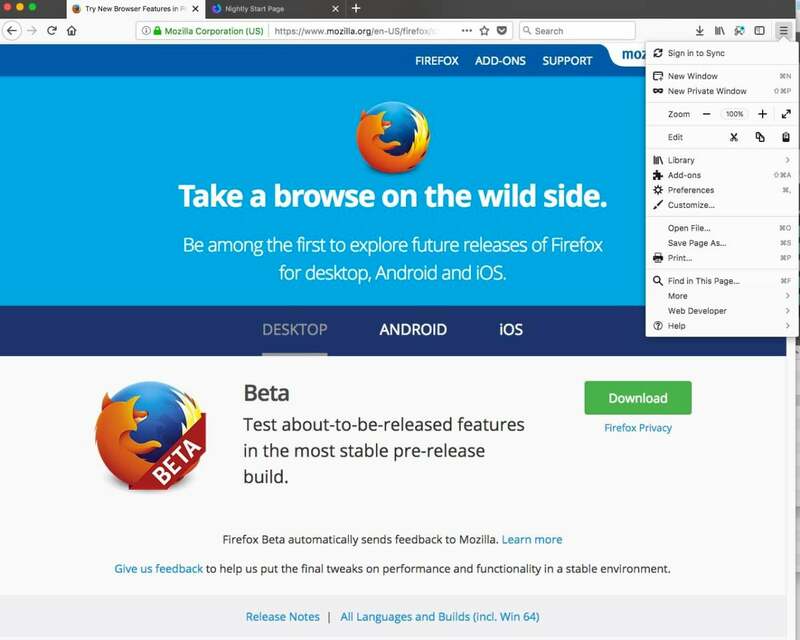 Firefox Beta is where features nearly ready for prime time live. As of this writing, the latest Beta version was released Aug. 8. Unfortunately, only one copy of Firefox can be open on the same machine at the same time. If you’re a Firefox fan, spending time in Nightly or Beta is worth it. That’s especially true if you’re looking forward to Firefox Release version 57, due Nov. 14, which will feature the new Photon interface. For example, in Nightly, the applications (or “hamburger”) menu contents appear in a list, vs. the icons you see in Firefox’s current release. Firefox Nightly and Beta are also available for Android. iOS beta versions of Firefox are available via Apple’s TestFlight app. Safari Technology Preview is Apple’s experimental browser, introduced in March 2016 and updated to version 42 on Oct. 18. It gives developers and users a first look at upcoming features that may be added to future versions of Safari on macOS and iOS. Currently, you can download Safari Technology Preview for macOS Sierra (the current OS) or the macOS High Sierra beta. It’s not available as an iOS download. 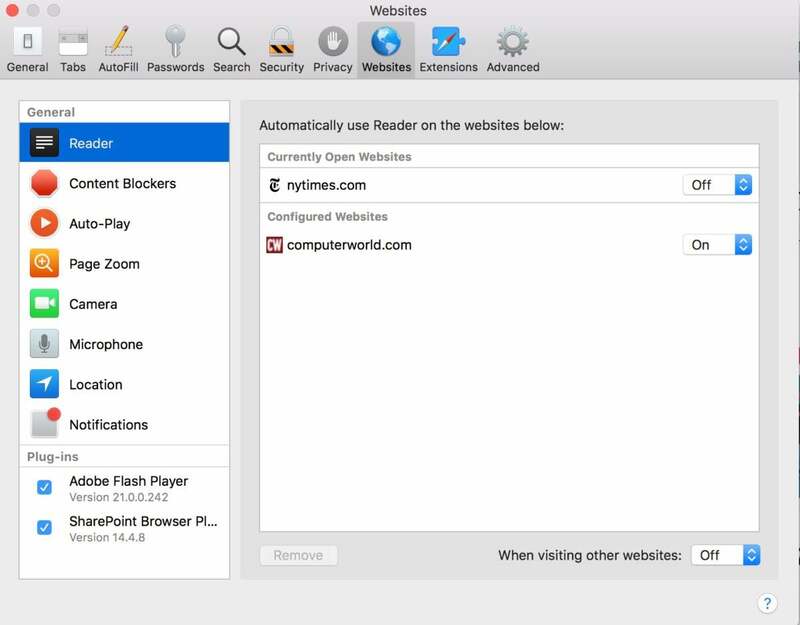 Similar to Canary, Safari Technology Preview can run side by side with the current Safari browser. (That’s not the case with Safari beta.) It’s super-easy to install, and you don’t have to be a developer. Recent Safari Technology Preview updates have enabled Beacon API by default and added new Beacon API features; added Apple Pay payment requests (which enable individuals to send money to one another); and added WebRTC options to the Developer menu (Apple is finally adding WebRTC support in Safari 11). You can also stay updated on the latest release notes, which detail what's new and changed for Version 42. With Safari Technology Preview, you can sample upcoming Safari 11 features in the new Websites Preferences tab — for example, automatically enabling Reader mode (which strips out distractions and emphasizes text) when visiting a specific website; enabling content blockers; automatically zooming a web page; automatically stopping a video’s audio from playing; and asking for permission to use the computer’s camera, microphone or location.